The Coopworth is a medium sized, dual-purpose, white faced sheep with an alert but quiet disposition. It is one of the most dominant breeds in New Zealand. It originated in New Zealand in the 1960’s from Border Leicester and Romney crosses, and was first imported into the United States during the late 1970’s. It is a highly productive sheep, intensively selected for easy care lambing, prolificacy, and good mothering ability. Coopworth wool is relativ1ely coarse and long and is popular with hand spinners. It was shortly after WWII, in New Zealand, when Professor Ian Coop began to selectively crossbreed Border Leicester rams on Romney ewes. His purpose was to improve lambing percentages. The resulting crossbred sheep were interbred over several generations. Always, the selection and culling of progeny was based on recorded performance. By 1968, it was determined that the successive generations of the interbred sheep had produced a medium sized, highly prolific, dual purpose, adaptable sheep and it was officially recorded as the Coopworth breed. Several large importations of Coopworths into the United States and Canada occurred in the 1970’s and 1980’s. These sheep were destined for both large, commercial operations and smaller, niche market producers and included white and natural colored animals. Today, due to costly quarantine regulations, artificial insemination is often used to obtain genetic diversity and continued improvement of the breed. The Coopworth is known for its productivity and easy care characteristics. Difficult births rarely occur and ewes have very strong mothering instincts, seldom leaving their lambs after birth. Multiple births are most common and the Coopworth ewe will provide an abundance of milk for her lambs. The lambs grow well on grass making this breed ideal for low-input, pasture-based systems. Rams are virile and settle the ewes quickly. Coopworth sheep are a medium sized, dual purpose, longwool breed, with an alert but quiet disposition. The long face is usually clean with a small topknot or bare head and a slightly Roman nose. They stand a bit taller than the New Zealand Romney and exhibit heavier muscling than the Border Leicester. The body is long with a good loin and hindquarter, light forequarter and a wide pelvis. The fleece, with pointed locks and bright luster, has a well-defined crimp averaging 3.5 crimps per inch and a fiber diameter of 35 to 39 microns. The staple length is 6 to 8 inches. Both white and natural colored Coopworths are accepted for registration. It is not unusual to see differences in appearance between individual animals because selection is often based on measured performance, rather than phenotype. For this reason, several wool styles are considered acceptable. These would be similar to Border Leicester and New Zealand Romney wool types. General- Coopworth sheep are sturdy animals with a strong bone structure and well-balanced, capacious bodies. In addition, the Coopworth has an alert but calm and confident disposition. Several wool styles are acceptable within the breed. However, only one style should be present on the body of a particular animal and it should be uniform throughout. Rams (175-275 lbs) should exhibit masculine characteristics and ewes (140-175 lbs) should exhibit feminine characteristics. Emphasis should be placed on selecting for these breed characteristics. Head and Neck- The long face is usually clean with a small topknot or bare head and a slightly Roman nose. Nostrils should be black or dark, mottled grey. Pink noses are less desirable. The neck should join smoothly with the shoulders. There should be no scurs or horns. Body- The forequarter should be light and the shoulders level with the back. The back should be straight with good length and a flat loin, blending smoothly from the base of the neck and ending in a minimal slope. The hindquarter should be broad to accommodate a wide pelvis. Legs- Front legs should be straight and wide-set. Rear legs should have a slight natural curve from a side view, and be straight and wide spread from a rear view. Pasterns should be strong and upright. An otherwise good sheep should not be disqualified if the hooves exhibit some light color, although black is most desirable. Udder or Scrotum- Ewes should have well-formed, soft, even udders with two good teats. Rams should have two large, even, well-developed testicles. 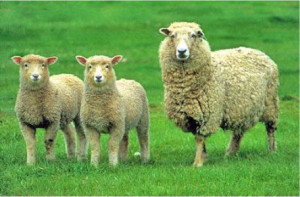 General- Because selection has historically been based on measured performance, rather than phenotype, several wool styles are acceptable within the breed. However, only one style should be present on the body of a particular animal and it should be uniform throughout. The crimp should be well defined from the base of the lock to the tip. Both white and natural colored fleeces are acceptable. Character- The high yielding fleece should be uniformly crimped overall with a soft hand. Locks are broad and free of crossed fibers, kemp and hair. The fleece should exhibit good length and 3.5 crimps per inch. Color- The fleece should be free of stains. White Coopworth fleeces should be free of black or brown fiber. Natural colored fleeces may be variegated, exhibiting more than one shade in a fleece. Luster- The fleece should exhibit a bright, lustrous, healthy appearance. Quantity- Annual fleece production should be eight pounds or more for ewes, and 12 pounds or more for rams. This should be attributed to the density and length of the fleece rather than excessive lanolin content. Length- Annual fleece length should be 6-8 inches. Grade- Fiber diameter should be 35-39 microns.